Louise Davidson was the epitome of a free-spirited woman in early 20th Century, an artist of many talents and a friend of many artistic people in New York and Paris. Her varied career touched on music, acting, writing, painting, cartooning, and jewelry design. But in Ridgefield, her home for her last 34 years, she was better known for her work on the home front during and after World War II. Called “Lulu” by her friends, Louise Elizabeth Davidson was born in 1887 in Jacksonville, Fla. Her great grandfather, a native of Hartford, opened a store in Jacksonville in the mid-19th Century when the new settlement had a population of only 450. Her father died of yellow fever when she was a baby, and she grew up in a household of women that included her mother, grandmother, great grandmother, and great-great grandmother. Her stepsister, author and scholar Lillian Gilkes (also profiled here), once recalled how Davidson exhibited her free spirit from an early age. Many unusual characters would visit their Jacksonville home and one day, young Louise — still in a high chair — took a dislike to a woman guest and began deliberately misbehaving. “Well, what did she come here for?” Louise reportedly replied. She attended private schools in Jacksonville, graduated from Agnes Scott College in Atlanta, and studied singing and dancing in New York City. At a recital she gave, she met Geraldine Farrar, the opera star from Ridgefield, and they became lifelong friends. Her voice wasn’t strong enough for opera, but Davidson got a role in the Edwardian musical comedy, The Better ’Ole, which toured the country in 1919. Professional acting roles were hard to come by, so she worked as publicity director with the International Concert Bureau, creating advertising and brochures for musicians. Soon, she effectively became the agent for several, even touring with them. She went on to become a publicist for Brunswick Records, a major label in that era, and managed several stars, including Georgette LeBlanc, a French soprano for whom Claude Debussy wrote an opera. The two were to become longtime friends in Paris. In the early 1920s, Davidson was drawing a comic strip, The Dubb Sisters, distributed by Cosmos Syndicate, about two girls living in Manhattan. Around 1925, she worked with Anne Morgan, daughter of financier J.P. Morgan, and Mrs. W.K. Vanderbilt in raising money to build the 24-story “clubhouse” for the American Woman’s Association (a building that later became the Henry Hudson Hotel). In 1930, on a vacation, she fell in love with Paris. She spent the next nine years living in a hotel on the West Bank, painting, writing, buying and selling antiques, and designing jewelry for Neiman Marcus. She became active in the Gurdjieff Group, a coterie of artists and philosophers that included Margaret Anderson, founder of The Little Review, who helped introduce writers like T.S. Eliot, Ezra Pound and James Joyce; Dorothy Caruso, widow of Enrico Caruso, the singer; Katherine Hulne, author of The Nun’s Story; Janet Flanner, whose column under the byline Genet appeared in The New Yorker for many years; and Miss LeBlanc, the singer whom she managed. Through Flanner, The New Yorker in 1936 published a childhood memoir by Davidson, called The Alley. She also had a praying mantis that she would feed milk and bits of meat, as well as a large yellow snail. “He was quite tame and might have been here today, but I closed a door on him,” she said of the snail. “It’s strange how you can have an affection for a creature like that. But,” she added, “you can be in touch with everything on this planet. Later, at her home on Olmstead Lane, she would periodically harbor ailing creatures and once nursed an injured robin back to health, allowing it to fly around the objets d’art and antiques in her house — her maid of many years threatened to quit on account of it. As war threatened Europe, Davidson returned to the United States, settling in Ridgefield — probably because her friend Geraldine Farrar lived just around the bend on West Lane. With Farrar, she became active in the Red Cross and the American Women’s Volunteer Service, which, among other things sponsored the motor corps that provided essential transportation on the home front during the war years. She helped organize several Bastille Day celebrations aimed at raising money to help war-torn France. For one, Main Street was closed off and there were dances in the streets, sidewalk cafes, and exhibits. During the war, she operated a small book shop near where Ridgefield Hardware is today, and in 1946, began running an antiques shop at the then-new Stonehenge Inn. She also volunteered as publicist for the Ridgefield Summer Theater. Though then in her 60s, Davidson studied acting in the early 1950s with Eva LeGalliene at the White Barn Theater in Westport. Although she had studied many of the arts, she never took formal lessons in a musical instrument. However, she did learn the harmonica in the 1920s from her friend, Borah Minevich, a noted harmonica player. 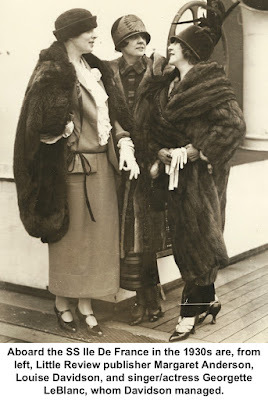 Late in life, frail health confined her to her home that she had shared with her stepsister, Lillian Gilkes. Unable to go outside, she became a great fan of baseball broadcasts and the New York Mets in particular — she knew every player and a wealth of statistics about them. She died in 1976 at the age of 89.